Today we present Tamsin Chubb, yoga teacher, coach, creative chef and owner of Little French Retreat, an intimate venue in Lot-et-Garonne which hosts yoga, meditation and wellness retreats as well as classes, workshops and supper clubs. Like many of us, Tamsin was introduced to yoga as a healing tool to cope with the stress of modern life and quickly found comfort in the practice. As she began to feel better, she began wanting to delve deeper into yoga and Hindu culture, to find more meaning and purpose. This quest led to Tamsin from London to the Himalayas for a Sivananda Teacher Training and eventually to the French countryside outside of Agen where she now devotes herself entirely to living her yoga and sharing its transformational power with others. PARISIANS: You are very lucky because this week Tamsin is leading a workshop at Atma Yoga Studio on Sunday October 1st. Info is here. What’s your « yoga story »? It was recommended by my doctor 20 years ago to begin yoga as a way to help with the acute anxiety and panic attacks that I was experiencing after the death of my father. Within a very short time it helped me feel calm and became a way to help me process my emotions. I practiced seriously for some time, until a job promotion led me down a corporate career path that became a great passion, yet left little time to practice or go to classes. After the passing of my mum 10 years ago I knew there was only one thing I wanted to do: to rekindle my love for yoga and focus solely on my well-being, and come to terms with loss and find new meaning and purpose in my life. What were you doing before yoga, personally and professionally? How did the practice come to take on more significance in your life? Was it a gradual shift? I had been working in bespoke furniture and interior design working for David Linley in London, and so, my life took a sudden shift when I quit my job to head to an ashram in India 2008. My mum had just died, I was living on my own and it felt like all my friends were having babies and immersed in the beginnings of parenthood. I remember this time as being very lonely and isolated, and my yoga journey opened my eyes to discovering a whole new world, one where I felt well and happy again, in the company of new friends, with a new confidence and desire to travel. Did the transition into teaching come easily? Did it take a long time or did it happen quickly? How did you decide on studying Sivananda Yoga? I never intended on teaching. Sivananda was the very first class and centre I experienced and I always liked the sense of peace I gained from the practice. So, it felt natural to rekindle my love of yoga with them. After spending time at their Neyyar Dam Ashram in Kerala 2008, I began practicing three or four times a week, and after several years had completely caught the bug. Yoga came before everything else, until eventually I realized I was hooked. I loved the way yoga made me feel and so the natural next step was to learn more. My first Teaching Training was with Sivananda in the Himalayas. I knew the style of yoga suited me, I knew the organization was recognized and gave a full and grounded approach, and I wanted to learn and gain a deeper understanding of the roots of yoga and Hindu culture in their country of origin. You do your Teacher Training, you begin teaching and then… you open your retreat center, Little French Retreat? How did that happen? What that always your intention? After the Teacher Training I continued to travel and serve in ashrams for the following year, allowing the transformation to settle. I didn’t want to return to my old life in the UK and felt a strong pull to live somewhere very peaceful and quiet, surrounded by nature. This led to a decision to move to France and buy my sister’s half of a family home left to us by our mother. From this point on I began to transform the house into a place of well-being, to teach locally and start retreats that I either taught or hosted for other teachers. It was all very organic and everything arrived naturally. So the Lot-et-Garonne region sort of came into your life. What special qualities does it have that are inspiring your teaching, your retreats, your cooking? The Lot-et-Garonne is not somewhere I would have chosen. It chose me, really, by circumstances in my life and an opportunity. Yet I have come to love its understated, gentle beauty—a lost world with an undisturbed landscape and slow, authentic way of life. It feels like a natural place to find peace and tranquility. There are many bio producers and farmers in the area that really care for the land and their crops and you can taste the difference this makes in the food quality and incredible flavours. Which are the perfect ingredients for cooking with purpose, well-being and positive energy. We really can’t talk about Little French Retreat without mentioning the attention paid to crafting nourishing, beautiful meals, and how you are applying Ayurvedic principles to French produce. Are marché visits an integral part of an LFR experience? I have always had a passion for food and value organic, natural ingredients. To me, quality is so important and you find it in abundance at the farmers markets here. All the food for retreats and events is hand-picked from local suppliers, eating in tune with the season and appreciating limitations as a source of creativity. If feels so good to know where the food comes from and to not have to visit supermarkets, ensuring packaging and waste is minimal. An Ayurvedic approach to cooking is a natural evolution and direction for me. Being the sister science of yoga, Ayurveda provides guests the opportunity to learn how important food is for healing and to feel the difference within themselves in just a few days on retreat. Whilst the food may not be traditionally French, I take inspiration from the regional produce when creating dishes and infuse various cultural influences drawn from my travels. In addition to organizing and planning the programs at LFR, you also teach in Lot-et-Garonne, offer private classes and public workshops like this one on October 1st in Paris. It feels important to be part of my local community as well as to reach out to a wider audience. I teach three weekly classes to a group of committed students that are such a source of inspiration to me. Many in the group began two or three years ago, coming to yoga later on in life, many of them being mostly in their 50’s and 70’s. Not only have they achieved the flexibility they started yoga for, but many have advanced their practice and can hold poses such as Sirsasana (headstand) and Utthita Hasta Padangustasana (extended hand to toe pose) which are challenging and demanding physically. Your yoga practices must be essential to keeping everything in balance. The balance of retreats, supper clubs, weekly classes and workshops that I run keeps things fresh so that I can continue to learn and be challenged. This approach also helps me balance my own energies. Speaking of balance, your upcoming workshop here in Paris, Yoga and Personal Development, touches on finding ease in the middle of stressful situations. Can you expand on that? This workshop has evolved through my own personal experience of relieving anxiety through yoga, and combines my professional skills as both yoga teacher and coach. We focus on breathwork and movement to release stress hot-spots in the body. I guide students to a place of deep calm with knowledge of how they can move through anxious and stressful feelings. The group coaching aspect of the workshop helps students recognize their fears and stresses, and is often a comfort in discovering we are never alone in our feelings. Sharing our experiences is a huge relief and an opportunity to open up and step towards acceptance and letting go. 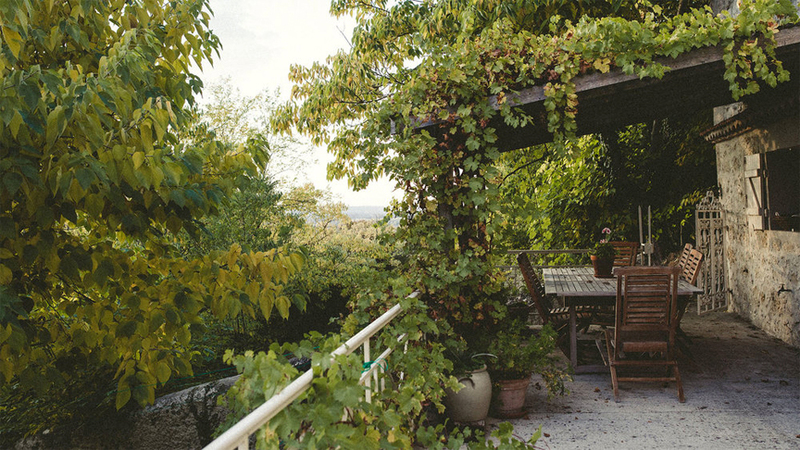 Can you give us an example of a typical day at Little French Retreat? I wake every day between 5h30 and 6h, make a cup of tea and stretch on the mat for an hour. I then feed the dogs, have breakfast and check my emails. After I walk the dogs and return to begin the rest of my day. By then it is around 11h. Days vary depending on whether I have a retreat or not. But I make sure I cook two good meals a day which takes time and then I balance between retreats, weekly classes, online coaching and managing marketing and social media. I have spent much more time than I would like to on the computer in the process of establishing Little French Retreat, but things are just beginning to get a little easier which gives me more time to be in the garden. I often like to repeat routines until I have a moment of inspiration and change everything, appreciating newness in another form. Sometimes this happens with the change of seasons and sometimes just because it’s time for a different challenge and the need to not get stuck. I would describe myself as a typical creative personality type, always thinking outside the box and seeking the experience of change, which I do consciously, to keep an eye on myself my and habits. You accomplish so much in a single day that we have to ask about your support network. Can you tell us a little bit about your team and how you found all of these dynamic partners? Working for yourself can be overwhelming at times, yet when I first embarked on a freelance life a good friend recommended I begin to create a ‘virtual team’ of friends and contacts around me. This concept helped me to reach out and ask for help. And I am very grateful for the incredible support I have received. Now in my fourth year at Little French Retreat, I have my teachers that inspire me to practice and live well as I do my best to pass on their teachings. I have a collection of people that helps me with social media and marketing, and I have traveling yogis and pilgrims who stay every year to help in the garden and with the maintenance of the house. I have found Facebook and Instagram to be invaluable for building connections locally and internationally. And of course by living in my village I have been able to gather together a group of suppliers for everything local. Building an infrastructure takes time and it’s always surprising where help comes from. One of the greatest things I have learned from my experience of moving to France without friends and the language is that when you are in a place of need and help, being humble and vulnerable is the doorway into heartfelt connections. People love to help others, it’s just we often forget to ask, out of pride or arrogance. Here in France my whole life has changed since I have asked for help, which has led to feeling part of my community. Which to me is a yoga life. Taking the teachings off the mat and into your world.